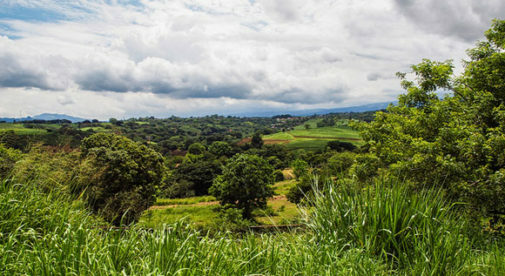 Paul Hastings and Marilyn Stevens landed in Grecia, a small town in Costa Rica’s Central Valley region, in October 2013. After a group tour and taking some time to explore other areas of the country on their own, they decided they wanted to live in the mountainous interior of the country with its temperate year-round weather. They now live in the hills above town, with views of the surrounding coffee plantations and forested river valleys. “The single biggest savings is on fresh-off-the-farm fruits and vegetables. Meat is about the same price, but the quality is so much better. It’s fresh from the farms in Grecia. And the beef is grass-fed,” says Marilyn, who adds they also get fresh chicken from one of their neighbors. Right now, they’re living rent-free as caretakers, with 60 days notice if the house they’re living in is sold. Not that they’re worried. There are plenty of low-cost rentals in the area, starting at $400 or $500 a month for a basic, unfurnished two- or three-bedroom home. While cost of living and weather were big pluses, this little Central American country offers other advantages, including proximity to the U.S.. The five-hour flight time makes it easy for the couple to fly back to visit friends and family. These days Paul and Marilyn are enjoying retirement to the fullest. Both are working on projects they’ve put off for years. Paul completed a novel (up for sale on Amazon) and is working on his second. He has also been crafting wood furniture for their home. Marilyn is writing a memoir based on her time caring for her mother, as well as a novel and is doing equine therapy with local kids. Plus, she’s indulging in her artistic tendencies working on glass mosaics. There are also lots of get-togethers with friends, and dinners and parties with the active expat community in Grecia. And, of course, there’s plenty of time for relaxing. They start each day enjoying Costa Rican coffee, which is grown in the hills surrounding their house. 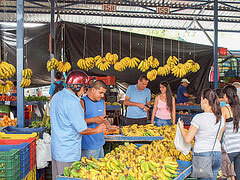 Grecia, a small town in Costa Rica’s Central Valley, is known for its ferias, where you’ll find straight-from-the-farm produce at affordable prices. “Being retired is terrific. I take a nap in the afternoon…or if I stayed up late the night before, at 10 a.m. if I want to. On Fridays, we like to go to Isabel’s—it’s an expat favorite,” says Paul, referring to a Mexican restaurant in a small hilltop village. The couple, who had worked as ESL (English as a Second Language) teachers for eight years prior to retiring to Costa Rica, also volunteer as English tutors in Grecia with locals interested in beefing up their language skills. “It’s really fulfilling. It’s a way to connect with this country in a meaningful way,” says Paul. All in all, the experience of moving to Costa Rica has been life-changing.